VANCOUVER — Tensions are building at Clark College. The recent influx of basic education funding from the state that led K-12 teachers to receive large raises last year have faculty at the region’s top community college crying foul. 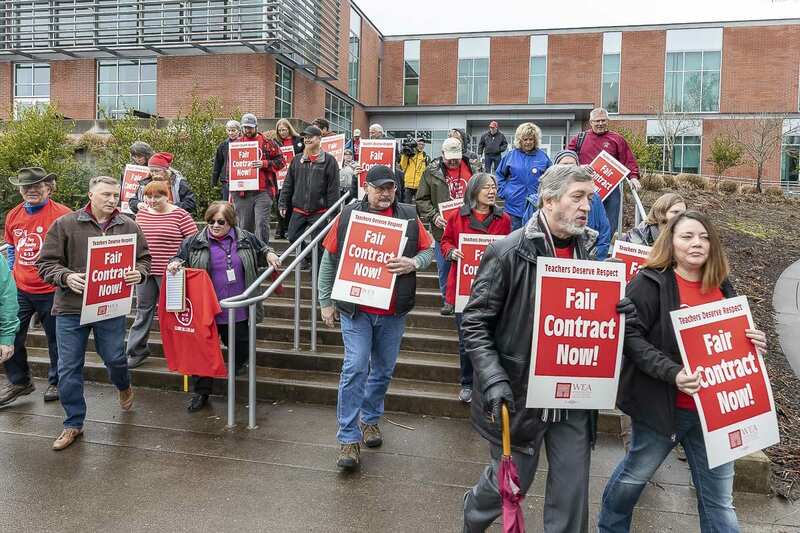 Wednesday, around 60 faculty members, along with some supporters from the community, marched with bargaining teams for the Clark College Association of Higher Education (CCAHE) to the Penguin Union Building on the college’s main campus where they were set to negotiate with college administration again. According to Suzanne Southerland, a tenured professor of communication studies at Clark, the union had presented their salary proposal back in the Fall. “By and large that proposal has been ignored by administration until just a few weeks ago,” she told ClarkCountyToday.com. Wednesday’s rally was the third union action meant to send a message to school administration that they are serious about securing serious wage increases. At a recent Board of Trustees meeting, Southerland says they heard some words of sympathy. 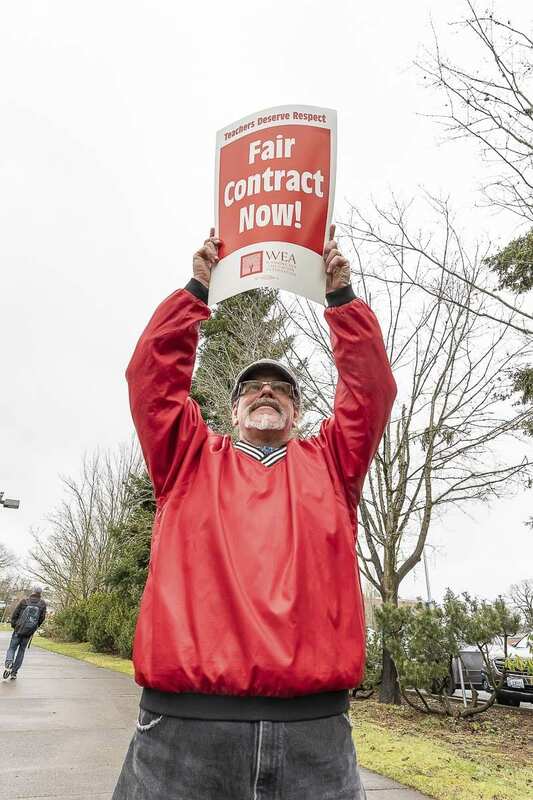 At that same meeting Board Chair Royce Pollard, former Vancouver mayor, drew groans when he suggested faculty go to Olympia to appeal to lawmakers for salary increases. Pollard’s point was that the legislature is tasked with balancing Clark College’s budget, and they’ve been actively lobbying for more money out of Olympia. Clark College President Bob Knight, who announced last month he’ll be retiring next August, has proposed five percent budget cuts due to a dip in student enrollment. Southerland says that’s only part of the story. In a statement the college called Wednesday’s negotiating session “productive and respectful,” adding that both sides will meet again in a week, ahead of the February Board of Trustees meeting. The college wouldn’t say what their latest proposal is, or what the union is requesting. Southerland says up to now the school has done little to address their demands. “The counter proposal that they’ve offered is not even close to acceptable and, in fact, they kind of proposed … a wage increase that we were going to get from the state anyway,” she says. According to AHE, faculty saw the recent raises given to K-12 educators and want a raise in line with what they received. “With the cost of living going up so much in the last 10 years, with K-12 salary increases, we’re just asking to be caught up so that our salaries are at least reasonable,” Southerland says. 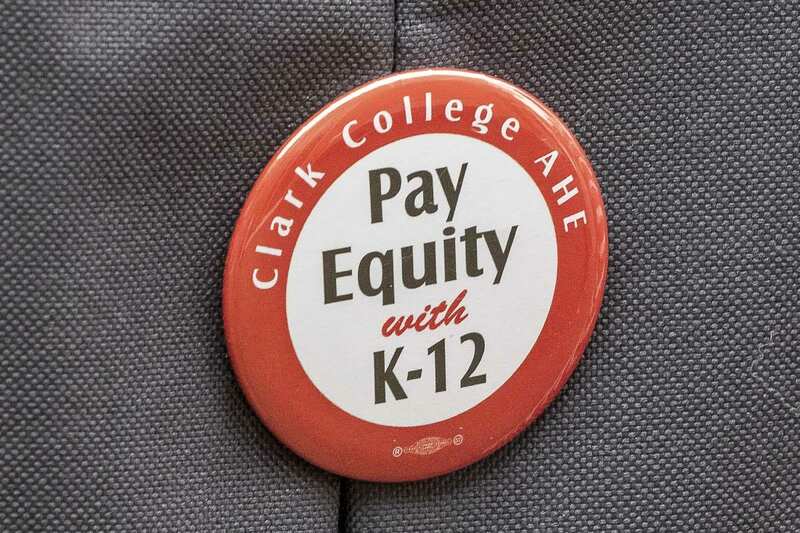 According to AHE, full time faculty at Clark College have traditionally earned around 10 percent less than educators with similar experience in the K-12 system. With the recent raises, their basic education counterparts are earning closer to 25 percent more. Full-time faculty at Clark College start off at $53,281, according to the union, and top out at $76,145. Full professors can earn up to $79,185. By comparison, at Evergreen School District, new teachers with a bachelor’s degree can start just under $43,000, but go up to over $91,000. In its statement, Clark College says they are keenly aware that faculty need to make a higher wage. For Southerland and other employees at the school, it comes down to a simple equation. “Your budget reflects your values,” Southerland says. While Southerland wouldn’t directly address the possibility of a strike, she did say that the union has already made bylaw changes to make way for a work stoppage if need be. “We really hope that they don’t make us strike,” she says. But if you go to to the Clark College Association of Higher Education website you’ll find, at the top of the page, a clock counting down with just over five weeks to go.